These are certainly not new to the internet, but they're to my kitchen and my mouth. As for what they are: a little slice of heaven on earth. No, that's not quite right. Well, it is, but that doesn't help you. 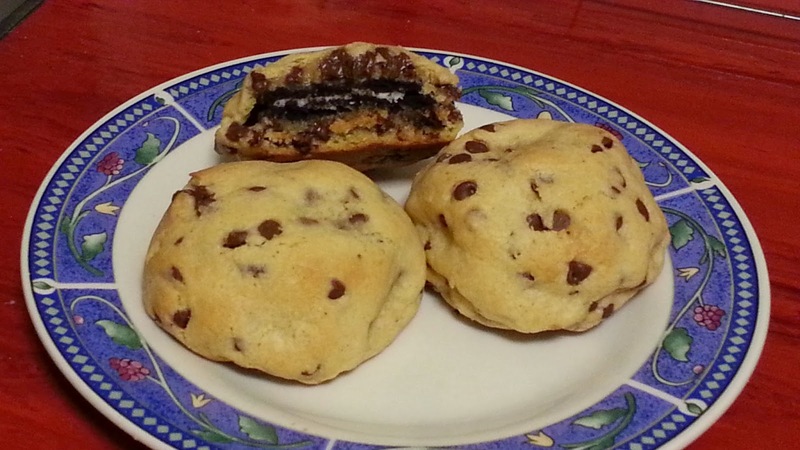 It's really like your two favorite cookies got together and had a baby. Make chocolate chip cookies. Put oreo inside. Pour glass of milk. Enjoy. I've seen this online before and passed them by, assuming that they were difficult and time consuming to make. They're not. Well, they are a little time consuming, but only by a few minutes compared to regular chocolate chip cookies. I used my normal chocolate chip cookie recipe, then added about an extra cup of flour so the dough would be a little stiffer and more likely to do what I wanted it to do. 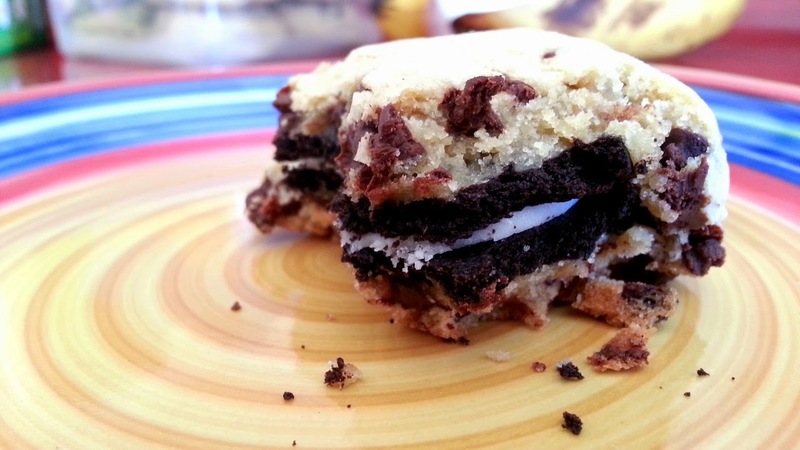 You can use double stuff or regular Oreos for these - whatever your little heart desires. 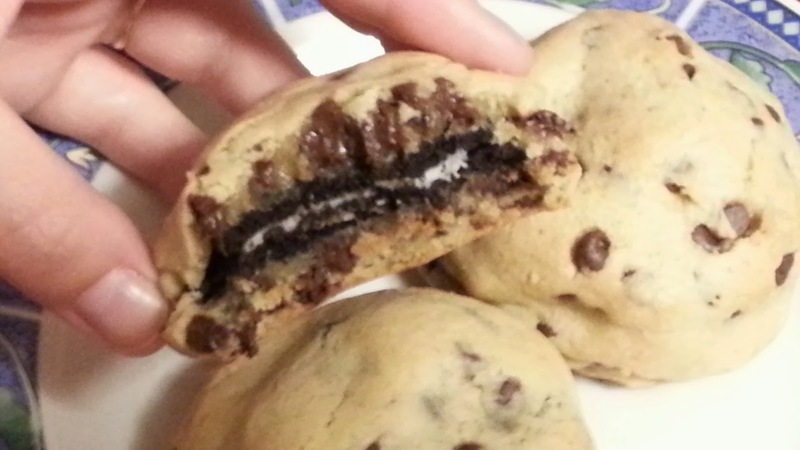 I made most of mine with regular but threw in a few double stuff for a surprise. 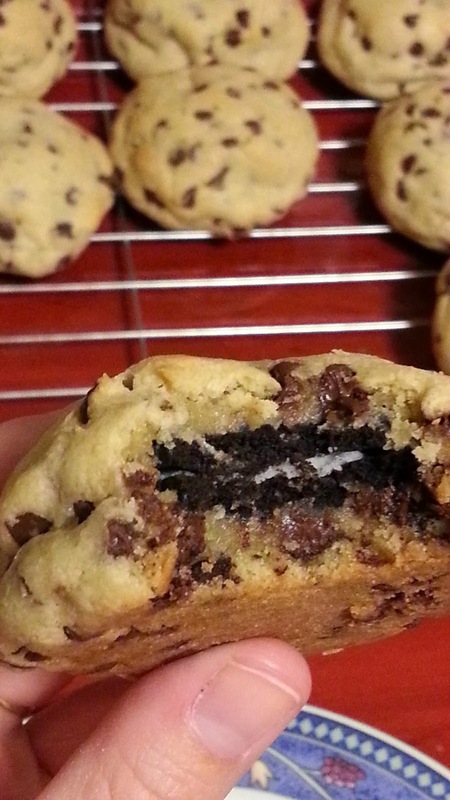 You're basically using two chocolate chip cookies for every one Oreo stuffed cookie, so you'll only get about 24 cookies or so out of this recipe. The thing is, you really only need to eat one, since it's kind of the equivalent of eating three cookies at once. Joe thought these were a little too sweet, but my brother, friends, 2 year old nephew and a coworker thought they were perfect (okay, so my nephew didn't *quite* know what to make of these bad boys, but he was still interested). If you're debating about which cookies to use, I would suggest the regular Oreos. The reason here is simple: this cookies are HUGE. It's easier to eat and enjoy when you can actually get it in your mouth to take a bite... and when you can dunk it in a nice glass of cold milk. Mmmm. Have I sold you yet? Go make some right now! In a large bowl, combine butter, eggs, baking soda and sugars. Mix in flour, one cup at a time. Fold in chocolate chips. 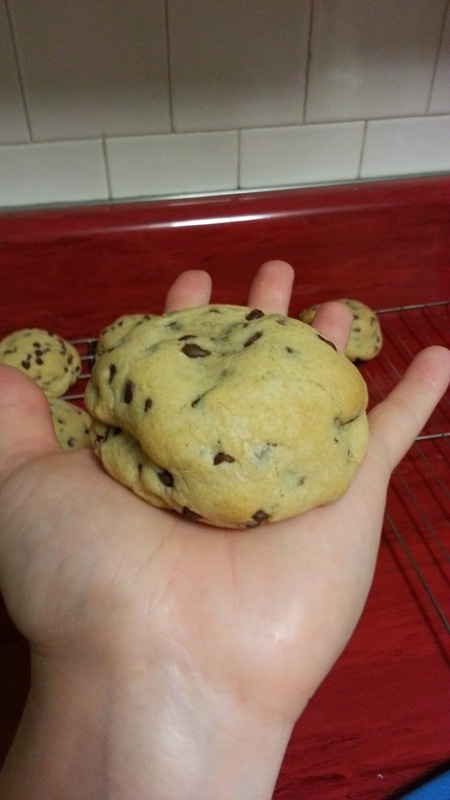 Using a cookie scoop or tablespoon, place one scoop of cookie dough in the palm of your hand and lightly flatten. Place one Oreo cookie on top. 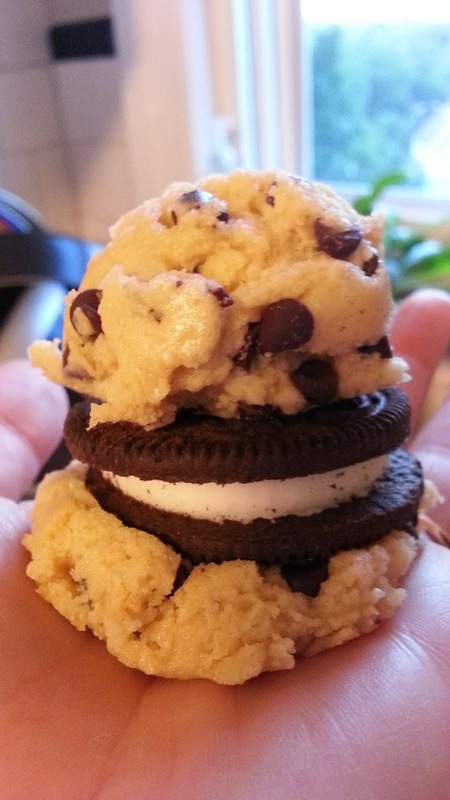 Place a second scoop of cookie dough on top of Oreo; use your hands to mold the cookie dough around the Oreo. Repeat for remaining dough and cookies. Place on a cookie sheet about 2 inches apart (you can pack them a little tighter if needed as they don't expand too much). Bake for 10 minutes until very lightly golden brown. Let cool on cookie sheet for a couple of minutes, them transfer to wire rack to cool completely.